With its motto “Innovations in Mechatronics“ Brose is showcasing solutions for the cars of today and tomorrow at the 2013 International Motor Show (IAA) in Frankfurt: new material concepts, a high level of functional integration and innovative motor technologies ensure weight savings and better efficiency. 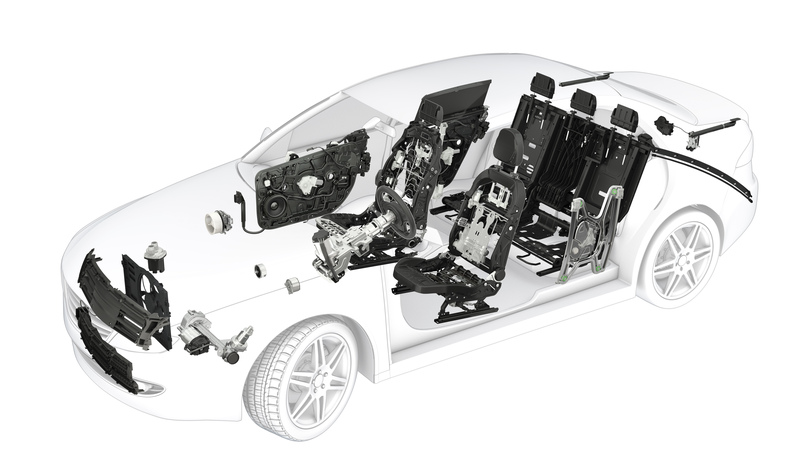 The mechatronics specialist’s seat systems show how lightweight and customer-specific design coupled with global availability can be implemented in complex OEM platforms. Brose’s new concepts for rear seats and the hands-free liftgate drive meet the car drivers’ need for enhanced comfort and safety. “Our goal is to expand our market position worldwide with these innovations”, explains Jürgen Otto, CEO of the Brose Group, at the company’s IAA press conference. Currently, Brose ranks 39th out of all automotive suppliers worldwide and is the fifth-largest family-owned in this industrial sector. The management board is striving for a growth rate of 3 percent for the current year. In the first six months of 2013, Asia (+21 percent) and North America (+17 percent) were the markets posting exceptionally high increases in turnover. The positive developments overseas offset the weak sales in Europe (-7 percent). Given these positive business developments, the company headcount in 2012 increased by 1,250 employees (+6 percent) to around 20,500, including 330 apprentices. The greatest increase in personnel could be seen in North America (+720, +22 percent) and in Asia (+430, +13 percent). The workforce has continued to grow in 2013: at the end of June there were 21,000 employees working for the family-owned company. Brose has consistently invested in boosting its expertise and in setting up new locations in the growth markets. In 2012, three new plants went operational in Chongqing, Peking (both China) and Querétaro (Mexico), and another production facility was acquired in New Boston/Detroit (USA). The automotive supplier will continue to build up its global development and production capacities in 2013, investing approximately 350 million euros. Besides further expansion in Asia and North America, a considerable amount will be invested in expanding the central German locations of Coburg (business division seat systems), Würzburg (business division drives) and in the area of Bamberg (business division door systems). This is where global development activities are directed from. The largest single investment will be made to set up a new administrative building in Bamberg. “We want to determine how we grow using our own resources, thus safeguarding our entrepreneurial and financial independence for the good of our company, its business partners and employees. Our customers expect to have a competent, strong and reliable partner and that’s what we aim to be in the future, too. We have set ourselves realistic goals with our intention to achieve a turnover exceeding 5 billion euros by 2015,” emphasizes Jürgen Otto. Around 8 percent of the turnover is invested annually in research and development. Approximately 2,500 engineers and technicians – over 10 percent of all Brose employees – work in this field at 19 locations in 10 countries. rare-earth magnets makes it economical without having to compromise on efficiency. The supplier has further examples in Frankfurt of increased efficiency achieved with electronically commutated motor technology for steering, transmission, cooling fans and other applications. At the 2013 IAA, the international automotive supplier is demonstrating its comprehensive expertise in front seat structures. The mechatronics specialist has set a benchmark for intelligent lightweight design in a joint project for Daimler and BMW. The front seat structure is about 25 percent lighter than comparable series products. At the same time, Brose has proven its international process expertise in the course of this project. The light seat structure has been designed based on a modular principle enabling it to be used in different vehicle models and thus offering both carmakers a high level of flexibility. Despite the common platform, the supplier has individual requirements to fulfill at each customer. There is pre-production, component production and the final assembly of seat structures taking place worldwide at eight plants located in close proximity to customer locations. Brose demonstrates what vehicle doors might look like in the future using two different concepts: the highly-integrated door system made of glass fabric reinforced polypropylene (thermoplastic composite), which is 350 grams lighter than conventional plastic solutions, is ready to market. Additionally, the company is presenting the prototype of a door structure made of carbon-fiber-reinforced plastic (CFRP). This opens up new possibilities in the vehicle assembly process: only the outer skin in the car’s color needs to be mounted and fixed. At the 2009 IAA, the concept was presented by Brose; in 2013, there are already twelve car models from three carmakers equipped with this feature. With its successfully launched hands-free liftgate, the mechatronics specialist has created a new dimension regarding comfort features. Theinnovative system has already received two prestigious awards – in 2011 the “BMW Supplier Innovation Award“ and in 2012, the “Pace Award“ which is considered to be the most important prize in the US automobile industry. In Frankfurt, the supplier is debuting a complete system for intelligent cargo area management with capacitive sensing for anti-trap feature and collision protection.